This CellML version of the model has been checked in COR and PCEnv and the model runs to produce results for the first cycle as in figure 2 of the published paper but does not display stable oscillations. The 'switches' described in Table 1 of the paper have not been implemented in this CellML description. Units have been checked and are consistent. ABSTRACT: A detailed mathematical model for the fission yeast mitotic cycle is developed based on positive and negative feedback loops by which Cdc13/Cdc2 kinase activates and inactivates itself. Positive feedbacks are created by Cdc13/Cdc2-dependent phosphorylation of specific substrates: inactivating its negative regulators (Rum1, Ste9 and Wee1/Mik1) and activating its positive regulator (Cdc25). A slow negative feedback loop is turned on during mitosis by activation of Slp1/anaphase-promoting complex (APC), which indirectly re-activates the negative regulators, leading to a drop in Cdc13/Cdc2 activity and exit from mitosis. 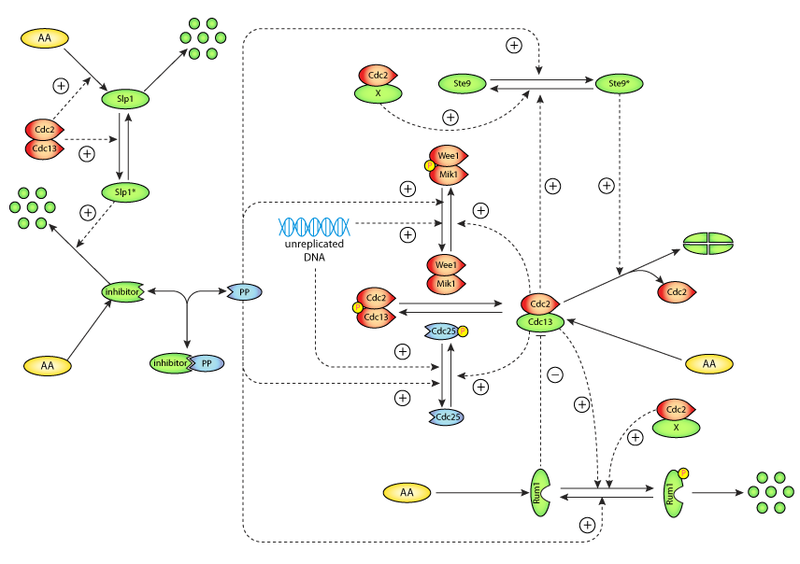 The model explains how fission yeast cells can exit mitosis in the absence of Ste9 (Cdc13 degradation) and Rum1 (an inhibitor of Cdc13/Cdc2). We also show that, if the positive feedback loops accelerating the G2/M transition (through Wee1 and Cdc25) are weak, then cells can reset back to G2 from early stages of mitosis by premature activation of the negative feedback loop. This resetting can happen more than once, resulting in a quantized distribution of cycle times, as observed experimentally in wee1 - cdc25delta mutant cells. Our quantitative description of these quantized cycles demonstrates the utility of mathematical modeling, because these cycles cannot be understood by intuitive arguments alone. A molecular mechanism for the regulation of Cdc13-associated kinase activity in fission yeast. Derived from workspace Sveiczer, Csikasznagy, Gyorffy, Tyson, Novak, 2000 at changeset a97ee8692690. Modeling the fission yeast cell cycle: quantized cycle times in wee1- cdc25Delta mutant cells.